Impresstik Systems Pty Ltd is arguably the largest & best known manufacturer of self-adhesive label application equipment in Australasia, and certainly at the forefront of the market in terms of machine technology, build-quality, performance and reliability. 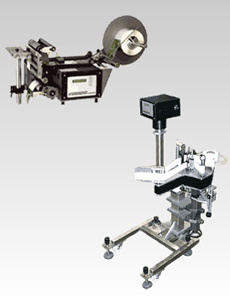 Serving all industries, including food, dairy, wine, beverages, pharmaceutical, cosmetics and personal care products, a comprehensive range of machine options is offered These include low-cost semi-automatic models to automatic in-line units, and ultimately fully integrated rotary machines for high-speed applications. All are represented by international agents in Asia, the USA, Canada, and South America. Pictured are the Impresstik ‘500’ bench-top semi-automatic model, and the ’1000’ free-standing labeller (ideal for promotional label applications). For more information about these or other applicators in the range, and for direct access to the Impresstik Systems Web-site, click here.